The last IMX rod I broke was probably 8-10 years ago.It was replaced with a GLX HLS rod.Nice rod but I liked the IMX better. Been fishing 6wt rods in the salt for years.Mostly with a Scott Heliply & Ross Canyon 3 reel but I also use a Sage RPL.I used to fish an intermediate line but I really like the ghost tip lines now.Google up an article by Ed Mitchell called The Salty Six.Good info. I just got the Cooper AT3 4S on my 06 Taco a couple months ago.Very nice riding tire and quiet.Got a good write up on Tacoma World.I ran Firestone Destination AT's before and liked them. Try the bay side of Henlopen,from the ship tower to the ferry wall.The jetty and beach area around IRI can be good also. I tried it once or twice years ago and picked up a couple under the lights.Not an easy place to FF and there are much better places to throw a fly. 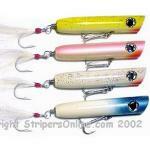 Stripers on a 6 wt? The article is "the salty six" by Ed Mitchell.Its a good read and worth Google search. My first reel was a Pflueger Sal-Trout,maybe a 1556.Upgraded to a Perrine automatic later.All this was in the mid to late 60's. I also agree on the Orvis Clearwater 8wt or something from TFO,maybe the Mangrove or Pro 2.Any of these should be good for most inshore salt and most freshwater bass,pike,ect.No way in hell would I suggest a 10wt rod for a beginner,man or woman.Thats just too heavy a rod to learn basic casting skills with.I have never heard of any casting schools using this gear for beginners.Just my opinion. Sorry,no camera.Its light olive head,white running line.